I am in receipt of the latest Michigan Pic from Babs. 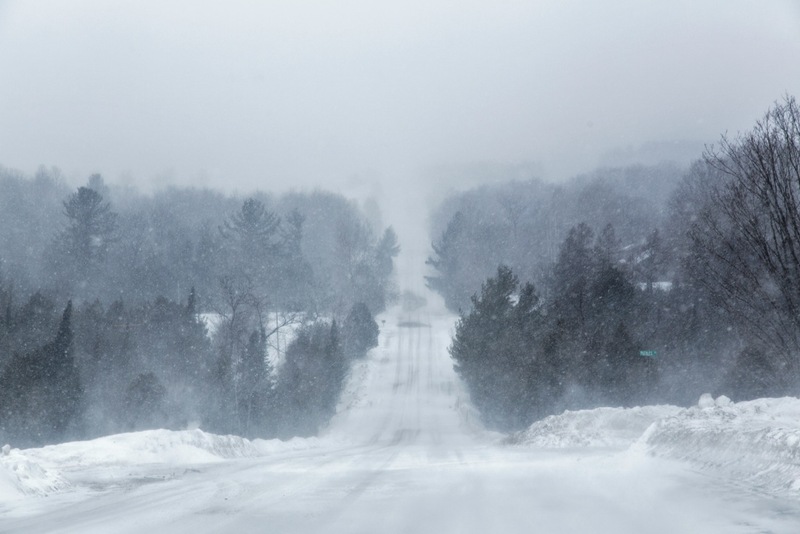 She captured a typical February day on the ribbon roads of Antrim County, and shows you better than I ever could why Miss Sadie, the Cowboy and I have not been out and about in the car so much. This is Ft. Jefferson on Garden Key in the Dry Tortugas 70 miles west of Key West. Construction began on this fort in 1846 and continued for 30 years, but it was never completed. During the Civil War this fort was used by the Union Army to house prisoners including four who were convicted of complicity in Lincoln’s assassination–including Dr. Samuel Mudd. Pretty amazing place. And so we come full circle to my beloved Civil War veterans. 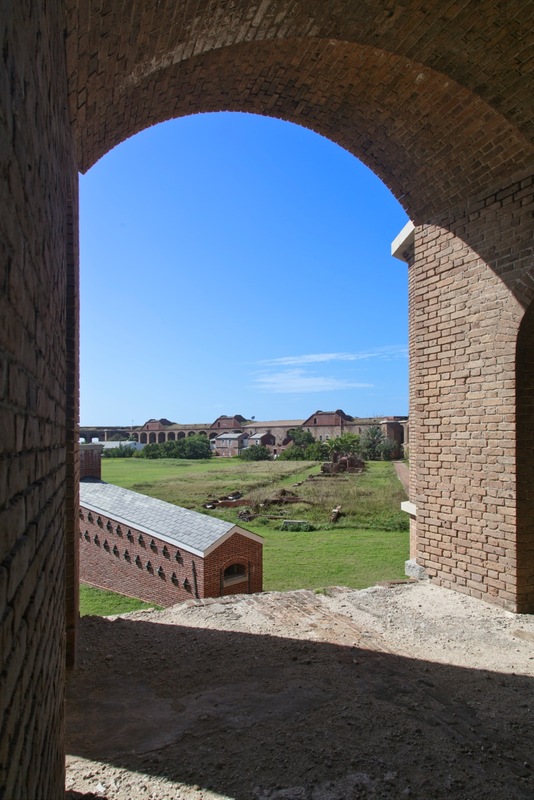 Not that any of them ever spent any time at–or in–Fort Jefferson. No indeed. Instead they were up here cutting down large trees with hand tools and disputing with the bears for provisions. Extraordinary people. Fortunately March will blow in on Saturday, and if March is here, the snowbirds will be not so very far behind. Which reminds me. Dear Snowbirds: If you plan to have beautiful flowers at your house this summer, you should be sure to order your geraniums from Loraine Mottern by Friday. I will give you a handy link: Preserving the Wilkinson House one geranium at a time. The best thing I can say about February about now is — it’s almost over! Yes . . . but March hasn’t been terribly kind to us Around Here. Ah well. Grousing about the weather is pretty much an Olympic sport in Antrim County. We have lots of opportunities to practice. Yes indeed, and I hope it stays long enough for me to notice that it’s here. I love cherry blossoms. We noticed an incipient cherry blossom in the park today. May is blossom time here generally speaking. If we get a warming spell too early, the cherries are fooled . . . and then a killing frost comes through and, well, kills them. If memory serves, 2012 was that sort of year. No harvest. This is just an ornamental cherry. We can’t grow eaters, more’s the pity. 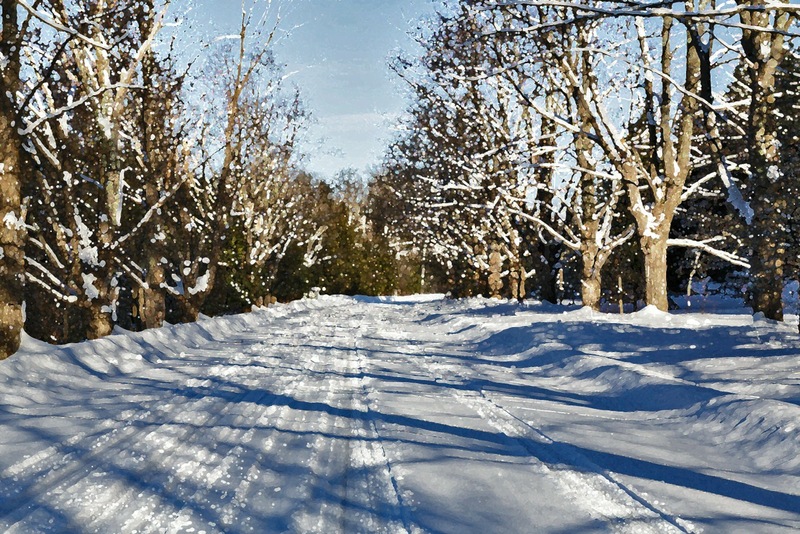 The road looks beautiful but scarey to drive on. I wish we had pictures of the Civil War veterans driving their carriages down the road. That road is more beautiful than scary, but I am a wuss. Antrim County’s Civil War veterans mostly walked – and they walked long distances without thinking anything of it. If anyone was lucky enough to have a wagon and a team, the whole neighborhood might pile on and go to a party. I’ll have to go looking for “transportation” photos. Well, the coots are gathering here. They spend the winter, and then head back to places like Minnesota, so I’m sure you have them, too. They tend to remain in small groups during their winter stay-over, but when it starts getting time to fly north, they begin to cluster in groups of up to 50. Sometimes more. I saw thirty swimming together today – one more front this week, and then perhaps they’ll be on their way. Many trees have budded out just in the past 2-3 days and there are a few wildflowers showing. Winter’s not over, but its days are numbered. That Flat Road photo is wonderful. I had to look up the coot in my Birds of Michigan Field Guide. I suspect I’ve seen them without knowing what I was looking at. I’ll have to look more carefully. I can’t imagine having wildflowers of any kind in February. Wait, wait – I can imagine it, just barely, and it’s lovely. Thank you – I liked Babs’s Flat Road photo too. We are not so much on a roller coaster as in utter free-fall, plunging toward glaciation. If I could wash clothes–my water supply is frozen again–I would know for sure that if I hung them out to dry they would freeze instead. I am grumpy. However, it is a very beautiful day out there. Crisp and sunny and – cold.